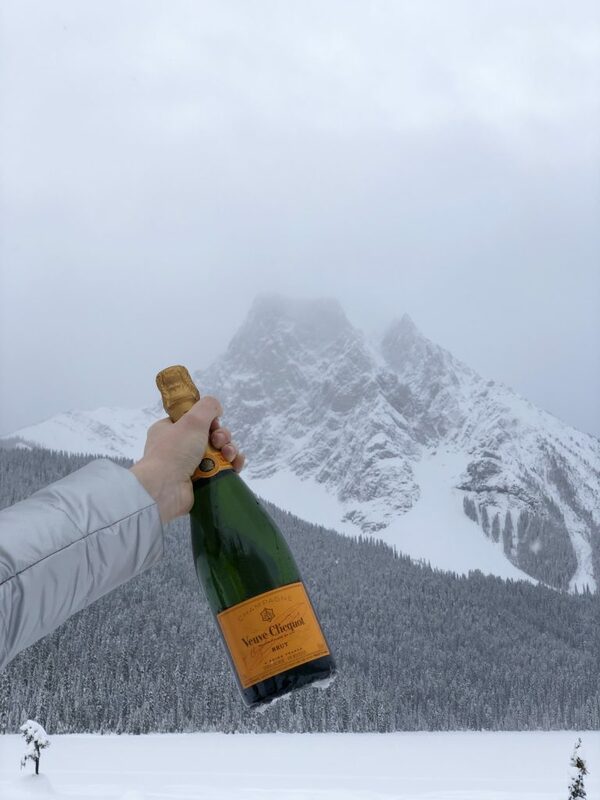 A few weekends ago, I had the incredible opportunity to visit one of my favourite Canadian destinations, the Rocky Mountains, that cross between Alberta and British Columbia. Although I had been to Banff and Lake Louise once before, I had never been to Emerald Lake, the largest lake in the heart of Yoho National Park, just 30 minutes past Lake Louise. 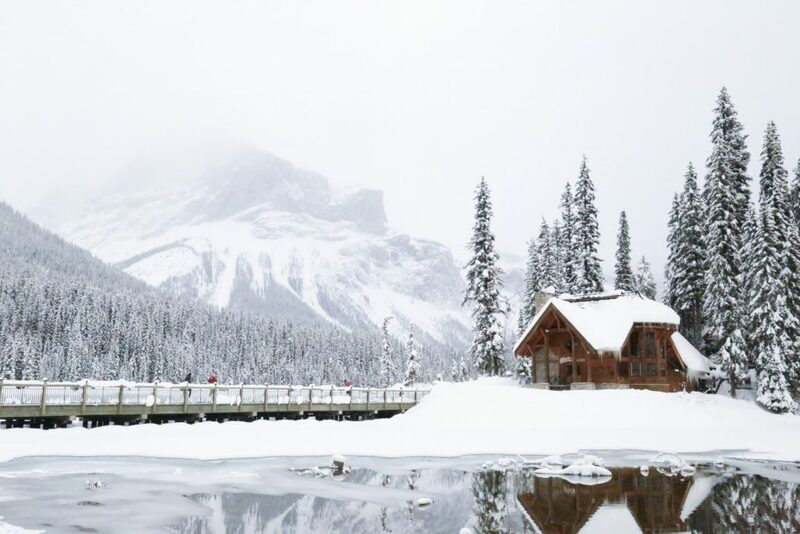 When researching where to stay, I found this adorable, picturesque resort called Emerald Lake Lodge and fell in love. I had also never been in the winter season, so I was ready to experience alllllll the outdoor activities the area had to offer! 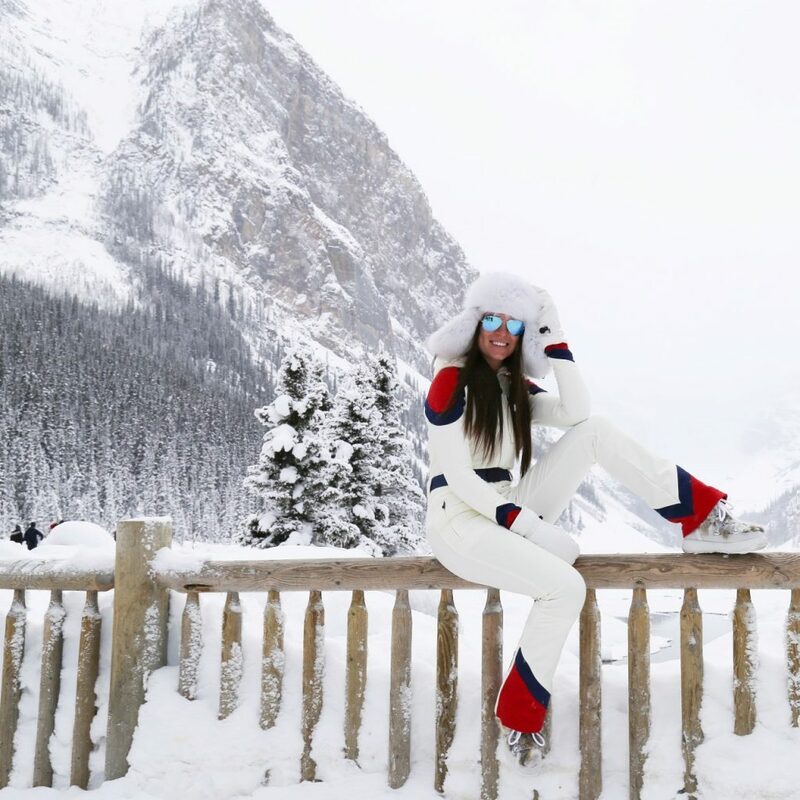 I’ve always been a big fan of outdoor adventure in general, no matter the time of year, but I especially love to take advantage of all of the opportunities winter has to offer: downhill skiing, cross-country skiing, snow shoeing, skating – you name it, I’m in. And I’ve gotta say, there’s no better place to play outside than the Rocky Mountains. This trip was especially exciting for me and my husband because my brother and soon-to-be sister-in-law joined us! And because I booked all of our flights using Aeroplan, I was able to earn enough Aeroplan Miles to cover our car rental (which of course gave us more spending money for wine!). If you haven’t signed up yet, you should! Shopping through the Aeroplan eStore has never been easier. All purchases you were already planning on making (hello Amazon.ca?! ), could help earn miles for your next trip; it really is a win-win! 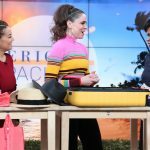 Now you’re probably wondering how you pack for a trip like this… Well, lucky for you, I wrote a detailed list of what (and how) to pack, right HERE. 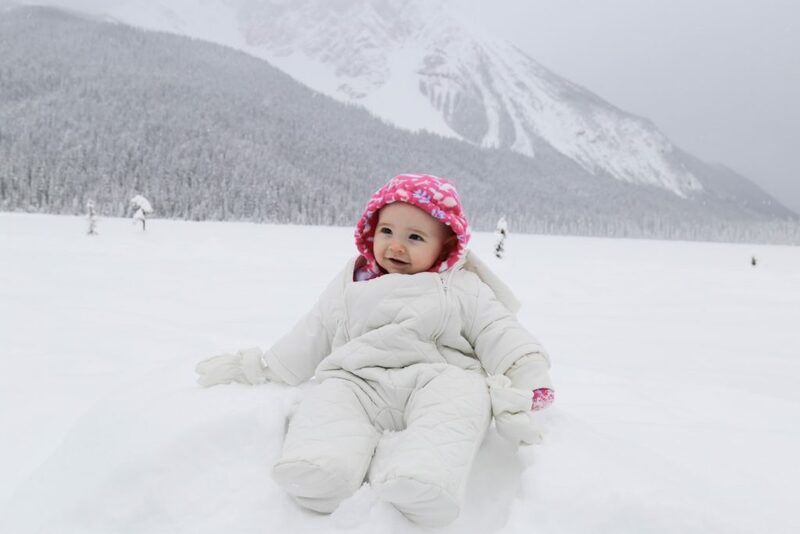 After landing in Calgary and grabbing our rental, we began our journey to the mountains. One stop we had to make (and I recommend you do too), was to Canmore for lunch. Canmore is a quaint and tranquil community just 30 minutes outside Banff, and is full of local boutiques and delightful restaurants. 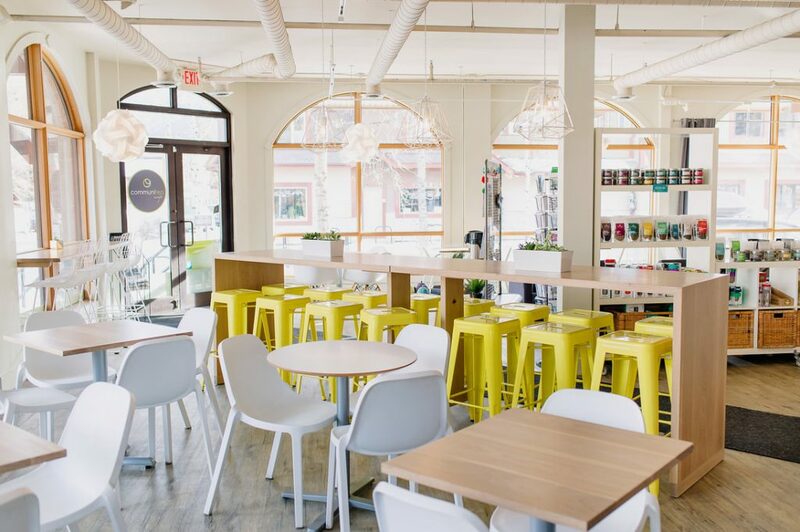 We stopped at a Canmore favourite, Communitea, where we ate delicious homemade sandwiches and drank copious amounts of steeped tea (they have close to 100 different teas – it’s amazing!). Tummy’s full, we finished our drive arriving at the majestic Emerald Lake Lodge with time to spare before dinner. It was even more beautiful than their photos on Instagram (which is actually how I discovered them!). We settled into our adjacent cabins, where we made a fire (every room is equipped with its very own wood burning fireplace!) and enjoyed some cocktails before making our way to dinner at the main lodge. The Rocky Mountain Cuisine served at the Mount Burgess dining room was NEXT LEVEL. Every meal was a delight from their free-range elk, bison and caribou dishes to their lamb with mint and pomegranate relish (it was SO good, I ordered it twice over the weekend!). They also have a comprehensive wine menu that even included my FAVOURITE wine, Sancerre, which is usually a rare item on a wine menu. After a restful sleep, we were up bright and early (thank you two hour time difference!) 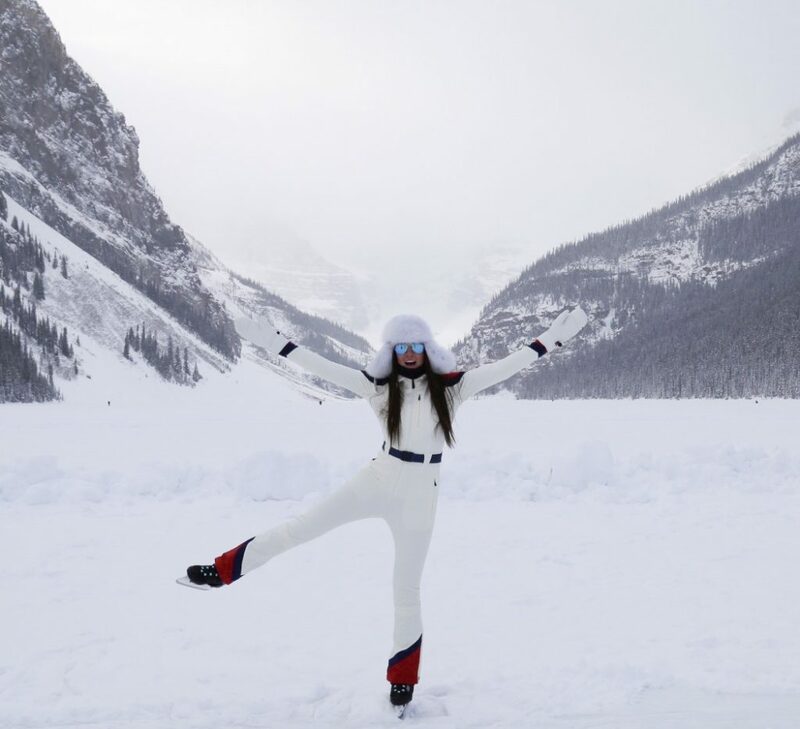 making our way to Lake Louise, spending the morning enjoying its views, and of course skating on the lake! We rented skates directly from the Fairmont and truthfully, it was the best outdoor rink I’ve ever skated on! The conditions were fantastic and we had a blast skating around (and attempting Scott and Tessa dance moves). 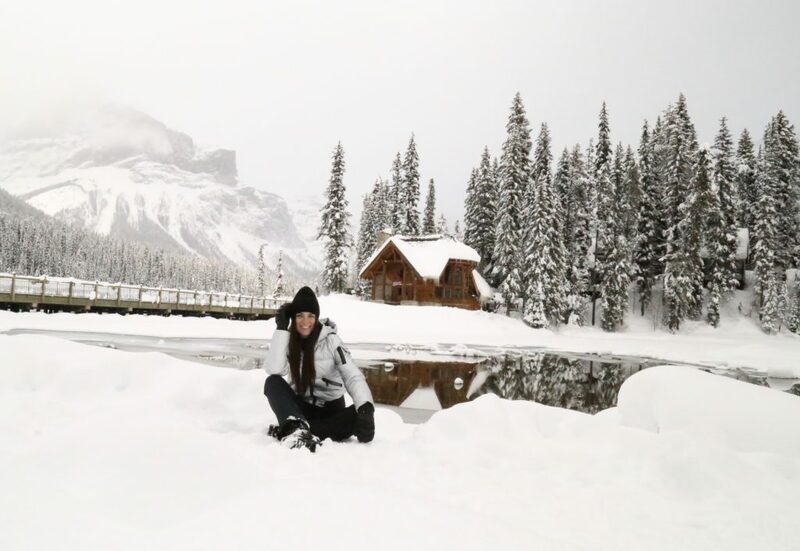 Later that day, we made our way back to Emerald Lake Lodge and rented some cross-country skis right there on the property – they had boots and everything! We even managed to ski the entire 8 km trail (with only a few falls… some more epic than others!) and I gotta say, the views were outstanding. After what felt like a six hour leg-focused workout, we hit the outdoor hot tub for some much needed R&R. 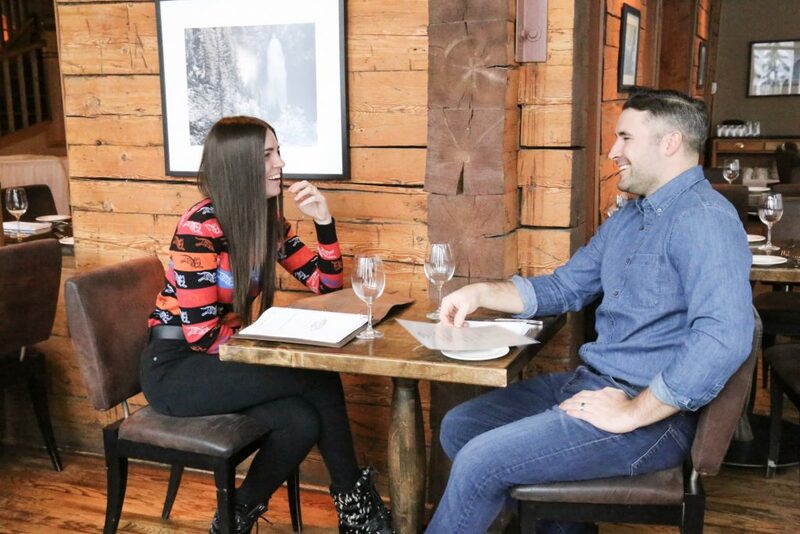 We hit the hot tub every afternoon before dinner – it was the perfect Après Ski spot before grabbing cocktails by the fire at the Kicking Horse Lounge (They made us delicious espresso martinis – the perfect drink after a day spent outside)! Friday night our friends from Edmonton arrived with their beautiful 7-month old Stella, so first thing Saturday we rented snowshoes and made our way around the entire lake. 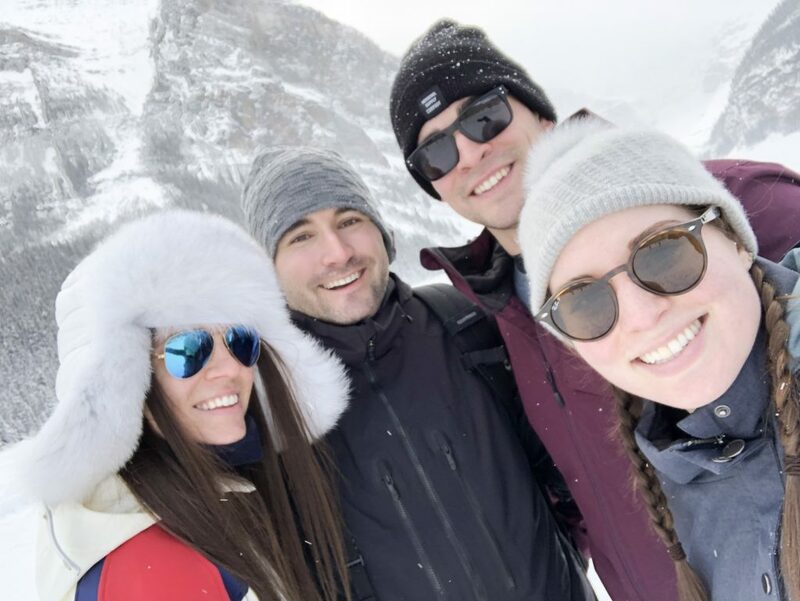 Snowshoeing was an even better way to take in the breathtaking scenery that surrounds the mountains (because we didn’t have to concentrate so hard on not falling on the skis LOL!). 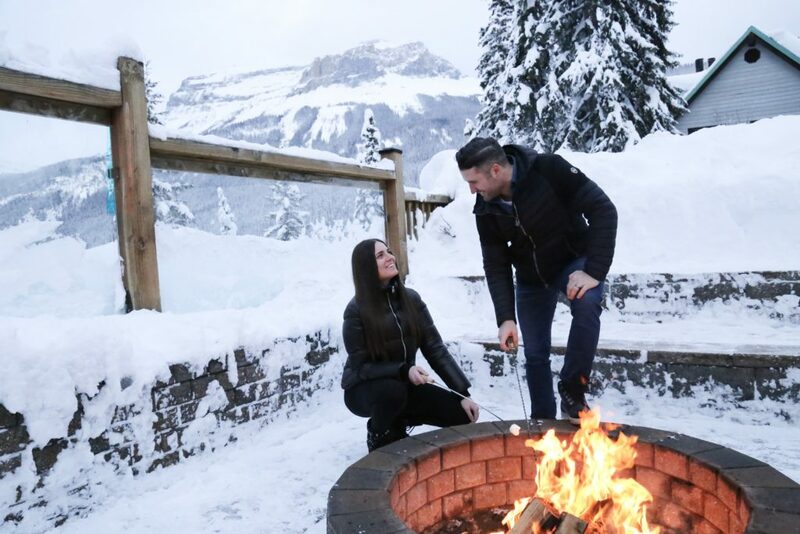 After another good soak in the hot tub, we enjoyed a beautiful outdoor fire and made s’mores – I felt like a kid again! The entire trip was something out of a feel good, warm your heart movie. The weather was incredible (it literally snowed light beautiful snowflakes the entire time we were there) which made it all the better to enjoy every second of daylight. 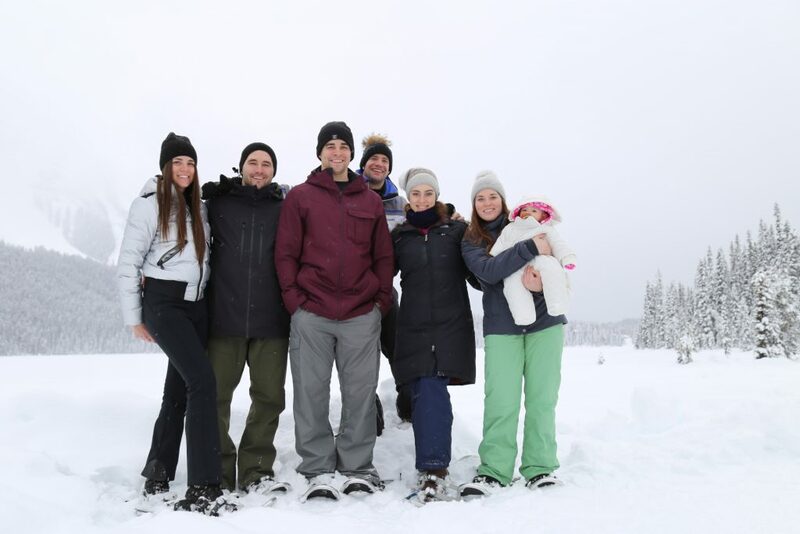 But more than that, spending quality time with family and friends – truly disconnecting (they don’t even have cell service up there – but don’t worry there’s still Wifi in the main lodge), laughing till you cry (and maybe pee) and reconnecting with nature is what made this trip truly special. If you haven’t been out to the rockies, please consider it for your next trip. It really is a ‘one of a kind’ place, and we’re so lucky to have it here, right in our Canadian backyard. All photos are my own. All Rights Reserved. This post was created in partnership with Aeroplan & Emerald Lake Lodge however all views and opinions are my own.